For other uses, see Arrest (disambiguation). An arrest is the act of apprehending a person and taking them into custody, usually because they have been suspected of committing or planning a crime. After the person is taken into custody, they can be questioned further and/or charged. An arrest is a procedure in a criminal justice system. Police and various other officers have powers of arrest. In some places, a citizen's arrest is permitted; for example in England and Wales, any person can arrest "anyone whom he has reasonable grounds for suspecting to be committing, have committed or be guilty of committing an indictable offence," although certain conditions must be met before taking such action.. Similar powers exist in France, Italy, Germany, Austria and Switzerland if a person is caught in an act of crime and not willing or able to produce valid ID. As a safeguard against the abuse of power, many countries require that an arrest must be made for a thoroughly justified reason, such as the requirement of probable cause in the United States. Furthermore, the time that a person can be detained in custody is relatively short (in most cases 24 hours in the United Kingdom and France and 24 or 48 hours in the United States) before the detained person must be either charged or released. The word "arrest" is Anglo-Norman in origin, derived from the French word arrêt meaning 'to stop or stay' and signifies a restraint of a person. Lexicologically, the meaning of the word arrest is given in various dictionaries depending upon the circumstances in which the word is used. There are numerous slang terms for being arrested throughout the world. In British slang terminology, the term "nicked" is often synonymous with being arrested, and "nick" can also refer to a police station, and the term "pinched" is also common. In the United States and France the term "collared" is sometimes used. The terms "lifted" or "picked up" are also heard on occasion. According to Indian law, no formality is needed during the procedure of arrest. The arrest can be made by a citizen, a police officer or a Magistrate. The police officer needs to inform the person being arrested the full particulars of the person's offence and that they are entitled to be released on bail if the offence fits the criteria for being bailable. There is no general rule of eligibility or requirement that a police officer must handcuff a person who is being arrested. When there is a question regarding handcuffing a person then at that time case laws has stated that the choice to handcuff a person is dependent on the surrounding circumstances, and that officers should always take the proper precautions to ensure the safety of themselves, and the public. Chicago police officers taking a man into custody. When there exists probable cause to believe that a person has committed a minor crime, such as petty theft, driving on a suspended license, or disturbing the peace, law enforcement agents typically issue the individual a citation but do not otherwise detain them. The person must then appear in court on the date provided on the citation. Prior to the court date, the prosecution will decide whether to file formal criminal charges against the individual. When the accused appears in court, they will be advised if formal criminal charges have been filed. If charges are filed, they will be asked to plead guilty or not guilty at the initial court hearing, which is referred to as the arraignment. When a person is arrested for a serious crime, the defendant will have their picture taken and be held in pre-trial prison. Under certain circumstances (that is where the public won't be endangered by one's release from custody), the defendant may be entitled to release on bail. If the accused cannot post a monetary bail, they will appear at their arraignment where the judge will determine if the bail set by the schedule should be lowered. Also, in certain states, the prosecution has 48 hours to decide whether or not to file formal charges against the accused. For example, in California, if no formal charges are filed within the 48-hour period, the accused must be released from the arresting host's custody. If formal charges are filed, the accused will be asked to appear at their arraignment. At the arraignment, the accused will be asked to plead guilty or not guilty, and the judge will set a bail amount (or refuse to set bail) for the accused. In 2010, the FBI estimated that law enforcement agencies made 13,120,947 arrests (excluding traffic violations). Of those persons arrested, 74.5% were male and 69.4 percent of all persons arrested were white, 28.0 percent were black, and the remaining 2.6 percent were of other ethnicities. Arrests under English law fall into two general categories—with and without a warrant—and then into more specific subcategories. Regardless of what power a person is arrested under, they must be informed that they are under arrest and of the grounds for their arrest at the time or as soon after the arrest as is practicable, otherwise the arrest is unlawful. A justice of the peace can issue warrants to arrest suspects and witnesses. the powers to arrest otherwise than for an offence, which apply to constables only. United States law recognizes the common law arrest under various jurisdictions. In the United Kingdom a person must be told that they are under arrest in simple, non-technical language, the essential legal and factual grounds for his arrest. A person must be 'cautioned' when being arrested or subject to a criminal prosecution procedure, unless this is impractical due to the behaviour of the arrested person. You are under arrest on suspicion of (offence). You do not have to say anything, but it may harm your defence if you do not mention when questioned something which you later rely on in court. Anything you do say may be given in evidence. Minor deviations from the words of any caution given do not constitute a breach of the Code of Practise, provided the sense of the caution is preserved. You are not obliged to say anything, but anything you do say will be noted and may be used in evidence. Based on the U.S. Supreme Court ruling in Miranda v. Arizona, after making an arrest, the police must inform the detainee of their Fifth Amendment and Sixth Amendment rights in order for statements made during questioning to be admissible as evidence against the detainee in court. A Miranda warning is required only when a person has been taken into custody (i.e. is not free to leave) and is being interrogated, and the results of this interrogation are to be used in court. An officer is not required to inform a person of their Miranda rights if they will not be questioning them any further after their arrest. An officer is also not necessarily required to provide a Miranda warning if the person they are questioning has not been arrested or if a person they have arrested speaks spontaneously without being questioned. There is also an exception that permits questioning without providing the warning under circumstances involving urgent matters of public safety. The warning must inform the detainee that they have the right to be silent, the right to legal counsel (and the availability of pro bono legal assistance), and that what they say can be used against them. The failure to provide a detainee with an adequate warning could make information obtained from an interrogation inadmissible in court, but does not prevent other evidence from being used to obtain a conviction. As in the British system, the exact phrasing of the warning is not explicitly mandated under federal law. There are also additional requirements about the warning that vary from state to state and may depend on the circumstances (such as when the arrestee is a non-citizen or juvenile). Since the exact wording used in an arrest is legally important, police officers often carry a printed copy of the rights with them and read from it when providing the warning to ensure accuracy. "You are not obliged to say anything unless you wish to do so but whatever you say will be put into writing and may be given in evidence." Breach of a court order can be considered civil contempt of court, and a warrant for the person's arrest may be issued. Some court orders contain authority for a police officer to make an arrest without further order. If a legislature lacks a quorum, many jurisdictions allow the members present the power to order a call of the house, which orders the arrest of the members who are not present. A member arrested is brought to the body's chamber to achieve a quorum. The member arrested does not face prosecution, but may be required to pay a fine to the legislative body. While an arrest will not necessarily lead to a criminal conviction, it may nonetheless in some jurisdictions have serious ramifications such as absence from work, social stigma, and in some cases, the legal obligation to disclose a conviction when a person applies for a job, a loan or a professional license. In the United States a person who was not found guilty after an arrest can remove their arrest record through an expungement or (in California) a finding of factual innocence. A cleared person has the choice to file a complaint or a lawsuit if they choose to. Legal action is sometimes filed against the government after a wrongful arrest. 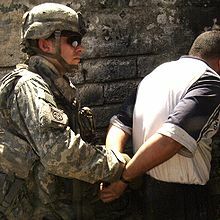 For convictions, the collateral consequences are more severe in the United States than in the UK, where arrests without conviction do not appear in standard criminal record checks and need not be disclosed, whereas in the United States, people have to expunge or (if the case goes to court) seal arrest without convictions, or if the charges are dropped. However, in the UK, 'Enhanced' CRB disclosures permit a Chief Constable to disclose this data if they believe it relevant to the post for which the CRB disclosure was applied. Wikimedia Commons has media related to Arrest. ^ "Police and Criminal Evidence Act 1984". archive.vn. 5 August 2012. Archived from the original on 5 August 2012. ^ Partridge, Eric and Paul BealeA dictionary of slang and unconventional English, p. 790, 886. ^ Hérail, René James and Edwin A. Lovatt, Dictionary of Modern Colloquial French, p. 194. ^ Partridge, Eric and Paul BealeA dictionary of slang and unconventional English, p. 681. ^ "Indian Kanoon -Shri D.K. Basu, Ashok K. Johri vs State Of West Bengal,State Of U.P". IndianKanoon.org. Retrieved 12 September 2011. ^ "CODE OF CRIMINAL PROCEDURE". Archived from the original on 7 May 2016. Retrieved 21 May 2016. ^ "HANDCUFFING: IS IT REALLY EASY AS IT SEEMS TO BE - Into Legal World". Into Legal World. Retrieved 2017-12-07. ^ "CA Codes (pen:1268-1276.5)". Archived from the original on 12 May 2016. Retrieved 21 May 2016. ^ "CA Codes (pen:813-829)". Archived from the original on 12 May 2016. Retrieved 21 May 2016. ^ "FBI — Arrests". FBI. Retrieved 21 May 2016. ^ Katz, Jason M. (2003). "Atwater v. Lago Vista: Buckle-Up or Get Locked-Up: Warrantless Arrests for Fine-Only Misdemeanors Under the Fourth Amendment" (PDF). Akron Law Review. University of Akron School of Law. 36 (3): 496–498. Archived from the original (PDF) on 11 January 2012. ^ "Under what circumstances can the police arrest me?". ^ "PACE Code G 2012". GOV.UK. Retrieved 2018-05-23. ^ Police and Criminal Evidence Act 1984, section 28 Archived 20 February 2009 at the Wayback Machine. ^ Code C to the Police and Criminal Evidence Act 1984, para. 10.5. ^ "What are my rights if I am being arrested?". Pre-Filing Investigation A pre-filing investigation takes place before a person is arrested and charged for a crime. A pre-filing investigation is when a person may be under investigation for a crime, but criminal charges have yet to be brought against him or her. Police Arrests USA police arrest records.